In Cuba farmers raise something they call corniche - both quail and these which I think of as cornish hens are two mouthfulls of meat and need to be cooked well or they are so tough. Quails were always hung by the butcher… The cornish hens I have always kept in the fridge for several days and then kept them longer in the freezer. I think you would be better off with regular or creole hens or rabbits. Rabbit is a great meat and they reproduce really quickly!!! I wouldn’t fiddle around with eggs and hatching and not hatching and pecking and all the rest. A rabbit will grow really rapidly on whatever roadside green you can find. If you put their boxes up high and put woodshaving etc underneath and put the chicken in there you won’t get the smell from the urine. Try and locate one of the Cuba farmers, technical people working in Cuba. If you can’t let me know and I will get a friend to contact a Cuban doctor who can message everyone to find someone to help you. My parents raised Cortunix quail for many years. These quail originate from the Mid East and should be able to tolerate warmer climate. The primary source for eggs and supplies are gqfmfg.com. Cortunix are fast growing and are full grow in 6-7 weeks. It’s a small bird with low feed intake. 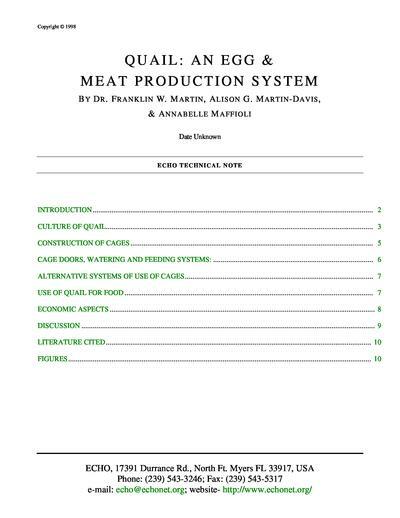 We have an ECHO Technical Note (TN35) "Quail: An Egg & Meat Production System", just in case you hadn’t seen it yet. I think Kate’s comment about chickens can be a good consideration. KORE Foundation is an organization with a program to produce chickens/eggs to feed children in Haiti. They could be a good contact for you. Thanks for bringing your question to the ECHO Community! I want so much to thank you for sharing your experience and for all your information and support. I apologize for taking so long to reply. A friend just offered to provide quail eggs and an incubator. I would appreciate to connect with your contact in Cuba so I can learn more of the process. I like also the rabbits idea, I will definitely try that after setting up the quail project. Thanks so much for your information, I will also pay attention to that possibility. Your information are very helpful. I really appreciate your support. He obtained some of his breeding stock in locally in Nepal, and also obtained some of the large white Texas A&M variety from someone in India. Quail have the advantage of being both meat birds and egg layers. He thought for his situation in Nepal, a better meat bird were the French Guinea Keets. The downside of Keets, compared to Quail, is that Keets do not lay an egg that is economically valuable. Love a Child based here in Fort Myers has a chicken broiler farm which they source chicks from Haitian Broilers for their ministry in Haiti. If interested I can put you touch with with either Love a Child or Haitian Broilers. I know that is not Quails but wanted to share another potential protein source for kids.